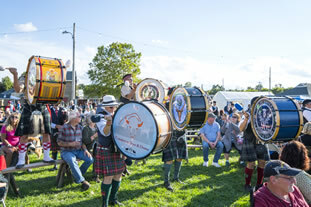 The Niagara Celtic Heritage Festival & Highland Games was formed in Autumn of 2001. The two day event draws about 13,000 guests and participants, and has become an important tradition for locals and visitors alike. Become a Patron and see your name here! Congratulations to our 18 winners! All feedback shown is unsolicited. Thanks so much to everyone for such kind words! Leave your feedback on our Facebook Page! Your comments help improve our festival every year. You may even see your comments added to this page! We always have a good time. So much to see and do and it seems to get better every year!! – Catherine C.
*Please email info@niagaraceltic.com with additional other questions. Niagara Celtic began at Olcott's Harbor Resort, and continued to grow after relocating to Krull Park in Olcott. We have now reached capacity at the park (for both festival activity and parking). The many festival organizers recognized the value in relocating to gain more space and ammenities, plus improved ease and safety for guests. After careful consideration and research the Niagara County Fairgrounds became the best choice. Niagara Celtic volunteers are thrilled to have more opportunities to grow the festival in many ways, allowing guests an even greater experience. Get ready to see the fairgrounds in a whole new way, unique to our festival, and don't worry- there are hundreds of trees! Free parking, all entertainment, events, attractions, and kids activities. You may choose to purchase food or products from vendors. Occasionally we offer special events for a price, but costs are listed prominently in our advertising. All parking is FREE, no matter the length of your stay. Once you reach the grounds we will help direct you to the closest possible parking spot based on your arrival time. There is a special parking area along the entrance (simply ask the traffic staff for directions once you reach the grounds). The festival has accessible facilities and large paths for wheelchairs. Our grounds are very large, so be prepared to do plenty of walking! We do not have on-site wheelchairs, canes or other personal needs, so please remember you will need to bring your own. We do not permit our transportation to be used for any private deliveries, tours or other personal trips. Vehicles are on-site strictly for emergencies and grounds/ staff use only. How do I find out about lodging? Click Here to view places to stay nearby, which includes nearby hotels, motels, bed & breakfasts, campgrounds and more. Yes, we have ATMs inside festival grounds. Tickets include wristbands which allow same day re-entry anytime at all our gates. Dogs are permitted. See Rules Under 'Bring Your Dog'. Bikes, rollerblades, skateboards, hoverboards, etc. Absolutely! We encourage all guests to come in costume. If you want to dress up but have no outifts, no worries: vendors will be stocked with everything from kilts to chain maile, head garland to cloaks. Looking for an outfit before you arrive? Visit our Resource Center for ideas. Want to show off your Celtic pride but not ready to be decked out in full garb? You'll find a wonderful assortment of shirts, hats and more for sale celebrating everything Irish, Scottish, Welsh and more. Is there shade on the festival grounds? The fairgrounds has hundreds of trees, along with many buildings and shelters. During the festival, many tents are also brought in to help act as cover for any type of weather. There are 3 mens and 3 womens restrooms on site. Several areas will also be set up with portable sanitary facilities and hand washing areas. Will my kids enjoy the festival? Yes, it is a wonderful event for children of all ages, and 12 & Under are FREE. There are special performances for kids, souvenirs, kid-friendly food, mini highland games training, and a huge area filled with countless activities and crafts. Better yet, nearly everything offered for kids is FREE (except food and vendor purchase)! The paths through the fairgrounds are suitable for strollers. Sorry, but we do not host carnival rides! Click here for more info. No, coolers, baskets, and all outside food and drink (except water) are NOT permitted on the grounds. You will be turned away at the gates, so please leave your items at home or in your car. We are open rain or shine, and do not offer refunds in the event of inclement weather. Only dogs are permitted at the fairgrounds during our festival. Please read our rules here before you come! **No other animals/ pets are allowed for their safety and the security of others. I lost something at the festival, whom do I contact to see if it has been found? Lost items may be turned in to Guest Services, located at the Front Entrance. All items will be kept for at least 30 days after the Festival. To inquire about lost items, call 716-778-5730 or email vicki@niagaraceltic.com. The Niagara Celtic Heritage Festival staff and volunteers take no responsibility for personal effects and possessions left on premises during or after any event. We do, however, maintain a lost and found and will hold recovered items at least 30 days. Every attempt will be made to return any recovered item to its rightful owner. Who do I contact if I would like to volunteer at the festival? Please email: volunteers@niagaraceltic.com or visit our Volunteer Page for information. I'm interested in donating or supporting the Niagara Celtic Heritage Festival. How do I go about this? We very much appreciate those interested in supporting our efforts! The best way to support us is to attend our festival as a guest. Your paying ticket allows us to keep the festival going, plus you help support our vendors and performers. Proceeds also give us the opportunity to "pay it forward" and donate to other groups in our local and Celtic communities. Become A Patron: click here | Consider becoming a sponsor- click here! What is your protocol for a lost child? If anyone in your party goes missing please notify the nearest security staff. They will commence a sweep of the grounds and work with the entire festival staff, using safety protocols, until the missing person(s) are found. What should I do in the event of an emergency if I am on festival grounds? Our First-Aid station, run by local fire safety and medics, is located at the Front Entrance. If you are unable to reach the entrance, notify the nearest festival volunteer or security staffer and they will ensure the first-aid staff comes to you. In the event of a large emergency, information and instructions will be announced on stages and over the fairground-wide sound system. In a suspension of operations, guests are encouraged to seek shelter in the permanent structures of the property, or to vacate the grounds if it is safe to do so. Why do you charge a fee at the gate? Contrary to occasional beliefs, few festivals anywhere are free to attend. Most require parking fees, tickets for highlight events, free to enter but charged per activity, or like us and many others, admission. Why? We pay for nearly everything happening on our grounds: hundreds of performers, historians and special guests, pony rides, security, insurance, electricity, kid's activities, tents, chairs, benches, animal farms, and on and on and on. Any festivals that are free are either small, government supported, or have no bills. Niagara Celtic is proud to be self-sustaining, while continuing to give back to countless other businesses, groups and performers by including them in our weekend events. Niagara Celtic is held only one weekend a year, but we are no different from The Sterling Renaissance Festival, Darien Lake or any other place that has activities from sunrise to sunset included in the fare. Plus, parking is free and children 12 & under are not charged admission...and we spend a large budget annually to ensure there's plenty of free crafts, games and activities for kids. So to sum up, your admission covers all the wonderful things you see and do all weekend-long, and towards the next year's festival (with any minor surplus supporting other local and Celtic groups/ activities...so it all goes back to our community). We're so grateful for all the support throughout the years, which allows our festival to continue growing, making it bigger, better and more worth the admission every year! Our festival takes great advantage of the historic fairgrounds, using the property in a unique way to truly show off both the festival and the grounds' hidden beauty. The fairgrounds are located on the north-end of the city of Lockport, less than 2 miles from their historic district and the Erie Canal. Locally you can enjoy the wine trail, history sites, and we're only 25 miles away from the Niagara Fall's tourist area. If you aren't from Western New York, consider extending your trip to include all the region has to offer! *Each listing shows distance from the festival. **If you're missing the shores of Lake Ontario, you can still stay in Olcott. The festival is only a 15 minute drive away! Niagara's Lazy Lakes RV Camping Resort Inc.
Large house/duplex with 6 bedrooms, 3 bathrooms, 2 living rooms and 2 fully equipped kitchens. Sleeps 14 people. Accepts weekend or weekly rentals. The festival is dog friendly! **Any dogs who fail to comply will be asked to leave, along with their owners. Dogs must be up to date on all shots and rabies vaccinations, and be wearing appropriate tags. No puppies under 6 months are allowed (for their own safety as they haven't received all vaccinations). Visiting dogs must behave well around other dogs/ animals and very large (unpredictable) crowds of people. We host cannon shot and gunfire demos, loud performances and crowded areas, so we are not for shy or nervous puppers! Any incidents must be immediately reported to first aid at the Front Entrance. Non-Service dogs are not allowed in any buildings. Dogs are not allowed to enter any children focused areas (notices are posted nearby).